OZEA LADY always focuses on providing our customer with best quality and service. Your satisfaction is our goal. Enjoy your dressing, enjoy your life. 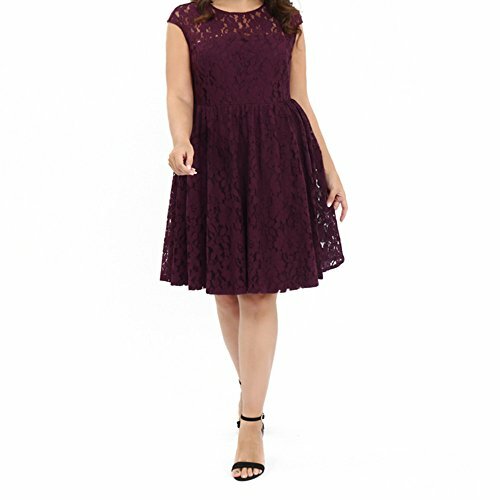 Find your own dress for party, cocktail, evening, prom, wedding, leisure, casual, church, dating, beach, dinner, going out and daily wear. ◆ Please compare the detail sizes with yours before you buy. ◆ According to the light and different computer monitor, the color may be slightly different as pictures. ◆ Besides, please allow differ due to manual measurement. Your understanding and support are highly appreciated. ● This product is made in our own factory through an emphasis on quality and customer service. ● We promise all of them are in the good quality. If you are not satisfied with it, we will give you a full 100% money back guarantee. ● Please contact us without hesitation if you have any problems of your order, we will try our best to help you. Thank you for your cooporation and Happy Shopping. ★ Fabric: Shell 44% Cotton, 28% Rayon ,28% Nylon. Lining 100% Polyester. Comfortable to wear and soft to touch.,very light weight but not see through. Breathable and stretchy,make you feel cool in hot summer. ★ Unique Design: Round neck and short sleeve make you look soft and gentle. Waisted shape will make you much more slimmer. Lace and Printed Pattern is stylish and elegant, give you a better figure curves. Concise design, delicate cut and workmanship set off temperament. ★ OCCASION: This midi dress can be effortlessly dressed up or down.The dress matches perfect with sadals or high heels, you can wear it to a wedding, graduation，bridal，baby shower, party, date, work, or traveling. Dress can match high-heeled shoes and sandal. ★ Garment Care: Hand Wash, Do not Bleach, Non High Temperature Ironing, Avoid Over Exposure. ★ Ozea Lady Guarantee: Please refer to our Size Chart in the Product Description. (Not the Amazon size chart) If your purchase is unsatisfactory in our Plus Size Dress, you are covered with our FAST free replacement guarantee! If you have any questions about this product by OZEA LADY, contact us by completing and submitting the form below. If you are looking for a specif part number, please include it with your message.